A service at FISCO involves a lot more than dropping the oil and changing a spark plug. All petrol machinery of course have the oil, spark plug, air filter and fuel filter changed(when applicable) but also we overhaul and adjust the carburetor and ignition, adjust the clutch, chains and belts, check and grease bearings and controls, compression test the engine,sharpen the blade( lawnmowers only) and fully clean down the machine. The machine doesn't need to be purchased from ourselves and we don't have to be a dealer for the product to service it. 1) Most modern pump fuels now contain ethanol which is very destructive to the fuel system in your garden machinery. 2) Aspen is storage stable for 5 years which means your machines start easier and perform better even after long periods of storage. 4) Less emissions = better for the environment and a much more pleasant working environment. 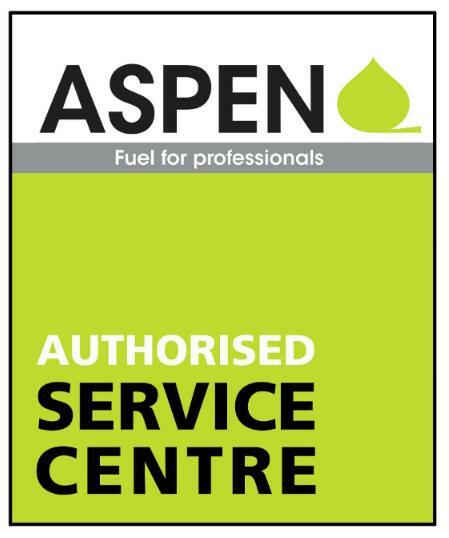 5) Aspen 2 is ready mixed with the highest quality 2-stroke oil resulting in optimum protection and machinery life for all your 2-stroke machinery. More information can be found on the Aspen website by following the link below.